Kangaderoo Custom QR Code. 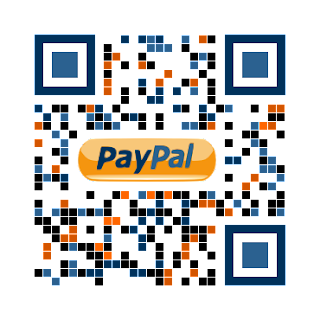 : Electronic wallet, the QR Code! Quote from the movie Broken Arrow: "So that's what this is all about? The money?" According to an article in the wall street journal PayPal unveils a new in-store payment. This new system will be using of QR Codes in combination with a mobile App to utilize mobile payment. Do we need another extra system for payment? I always thought cash is king. I guess PayPal itself want's it. Making transactions is what is making money for PayPal. If they can also operate in brick and mortar stores, that would increase their number of transactions. But is there a benefit for the customers? With the current technologies like NFC being part of the mobile phone, the next step is a phone that holds two smart chips-cards. One for your phone number and provider information. The other is basically the same chip that is currently part of your bankcard or credit-card. One option that I really like to see in a e-wallet, is that these new payment systems can also be used for fast and easy transfer money between two individuals. Paying a private person with a credit card is not always possible. With a e-wallet App on both phones, transactions between tow individuals would be the feature that would compel me to use this technology.